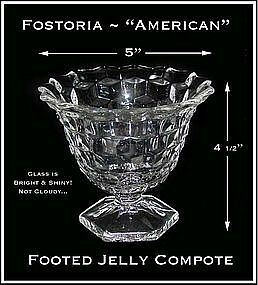 This American pattern footed jelly compote was made by the Fostoria Glass Co. It is in excellent condition! 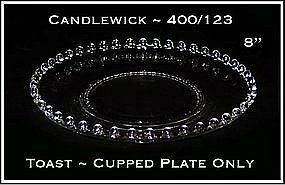 This plate is 8" in diameter and cupped upward. 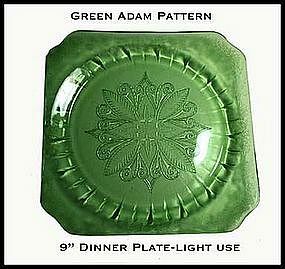 It is the plate only from the Covered Toast Set, and was only made for 10 years. 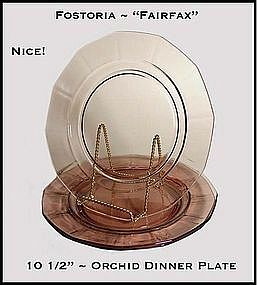 Fostoria Fairfax 10 1/2" Orchid Dinner Plate~ Super! 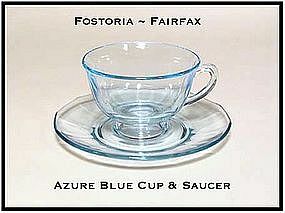 These Fairfax 10 1/2" dinner plates were made by The Fostoria Glass Company from 1927 - mid 1940's. They have some light stack/use marks, but not terrible. 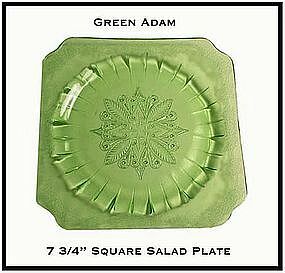 This is the large dinner plate, and this color is hard to find. 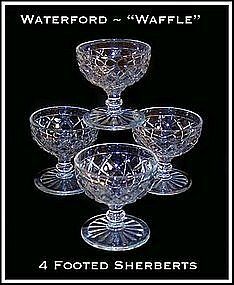 These 4 Waterford stemmed sherberts are in great condition! 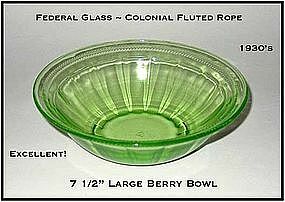 This Colonial Fluted 7 3/4" Rope large berry bowl was made in the 1930's by The Federal Glass Co. It is in excellent condition! Bright and shiny glass. Signed on the bottom with the letter "F" in a shield. 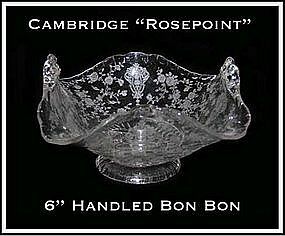 This Rosepoint 6 inch Bon Bon is in excellent condition! 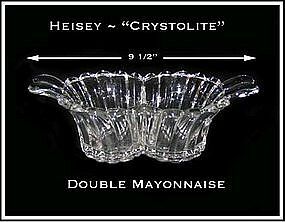 This Heisey Crystolite double mayonnaise is in excellent condition. Super design! 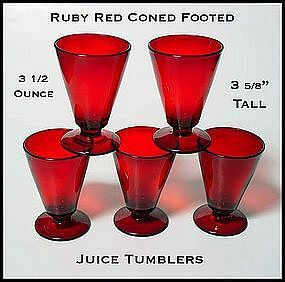 These 5 tumblers look like Hocking Royal Ruby, but they may be better glass than that. Very good quality! 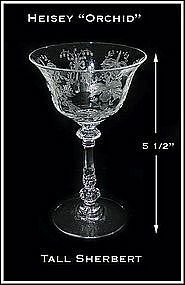 This champagne sherbert was made by The Heisey Glass Company before 1957. The pattern is Orchid, and it is in excellent condition. These Fairfax 9 1/4" dinner plates were made by The Fostoria Glass Company from 1927 - mid 1940's. They are in excellent condition! This is the smaller dinner plate. This color is hard to find. We are unsure of the maker of these stems, but we think they are Fostoria. The color is close to Fairfax Blue.... They are in excellent condition! 3 available. 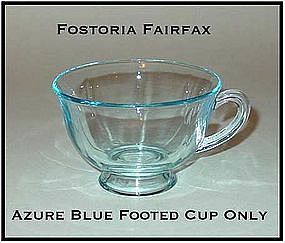 These Azure Blue cups and saucers were made by the Fostoria Glass Co. They are in excellent condition with no damage and not cloudy! 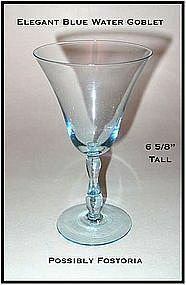 This Azure Blue Fairfax was made by The Fostoria Glass Co. in the late 1930's. It is in excellent condition! 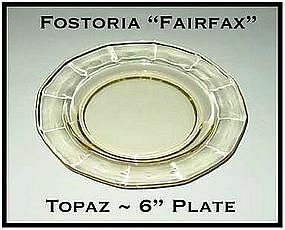 This Topaz Yellow Fairfax 6 inch plate was made by The Fostoria Glass Co. in the late 1930's. It is in excellent condition! 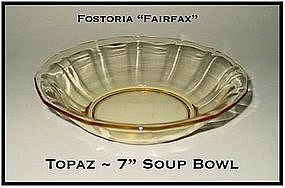 This Topaz Yellow Fairfax flat soup bowl was made by The Fostoria Glass Co. in the late 1930's. It is in excellent condition, and very hard to find! 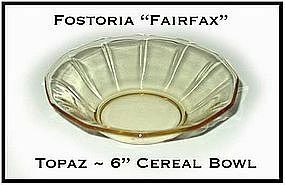 This Topaz Yellow Fairfax 6 inch cereal bowl was made by The Fostoria Glass Co. in the late 1930's. It is in excellent condition!